We are doing it again, soon! Are you ready? Plans for the greatest events of all times is on course. 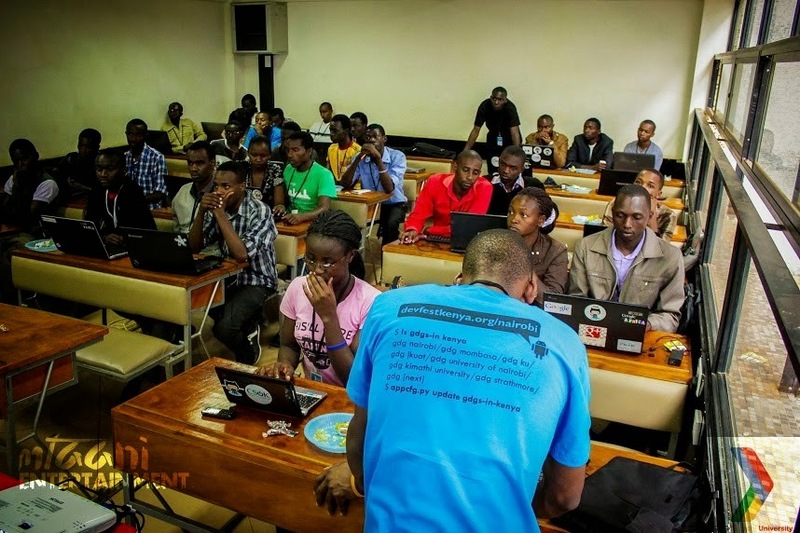 One of the biggest technical communities in Kenya, GDG Kimathi University, is organizing again the premier Devfest event, GDG Devfest Nyeri! What’s new on Android and other Google stuff, what’s new in the Google development platform? New ideas will be shared, new methods and tips of coding will be brought into light. Are you ready for a day full of inspiration ? Very soon students, tech enthusiasts, and developers will converge. 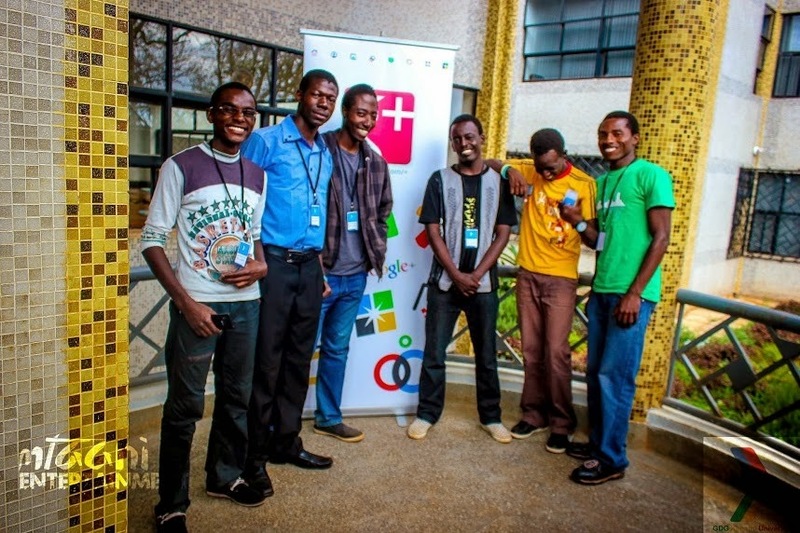 GDG Devfest Nyeri will bring together a diverse multidisciplinary, multi product speakers coming from all over country and even outside.Yes,we will have a speaker from Uganda .They will speak on the latest trends and technical knowledge in Android, Google Cloud Platform, Google Chrome, HTML5, Google Maps API, YouTube API and other Google developer APIs. Are you ready to learn from these awesome speakers? Code labs will be a place for you to learn and code. The code labs will be for students, startups and anyone. Experts in the specified field will take the stage and share with everyone the new techniques. But Are you ready? Are you ready for the labs and sessions? We are going to code, we are going to hack .We are going to create cool stuff. Get your ideas ready, get your team ready, Get your laptop ready and above all sharpen your coding skills. Get ready to roll up your sleeves to build something new. Are you ready to interact with exceptionally lively intelligent faces and build a network of developers? You are a lady, you have great passion for Google technologies and platforms, you feel technology has a place for you. We are mindful of your inclusion, this is the event for you. Are you ready? How much does it costs to get yourself a ticket? It’s absolutely free! You book yourself a ticket online from Eventbrite. Make sure you come along with it during the event. GDG Devfest event is for students, developers and tech enthusiasts, who believe that by sharing ideas in Google products and platforms they may have remarkable solutions to daily problems. Our core belief is that when developers and tech enthusiasts come together to exchange ideas, amazing things come out. Tickets are coming soon…Still,are you ready for 12 hours of pure Google content? The event will take place at DeKUT main campus. DeKUT is 8 km from Nyeri Town. It’s reachable by car, public transport or by foot, depending on where you come from. You can also find your way through google maps. Get ready for a Devfest like no other!! This is originally a repost by one of the +GDG Kimathi University Members. 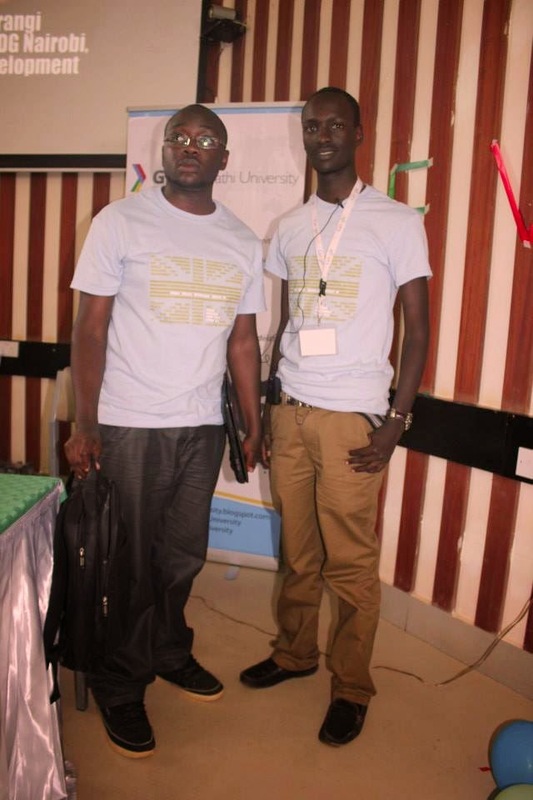 His take on GDG Devfest Nyeri 2013 and why you should come and attend Devfest 2014 . 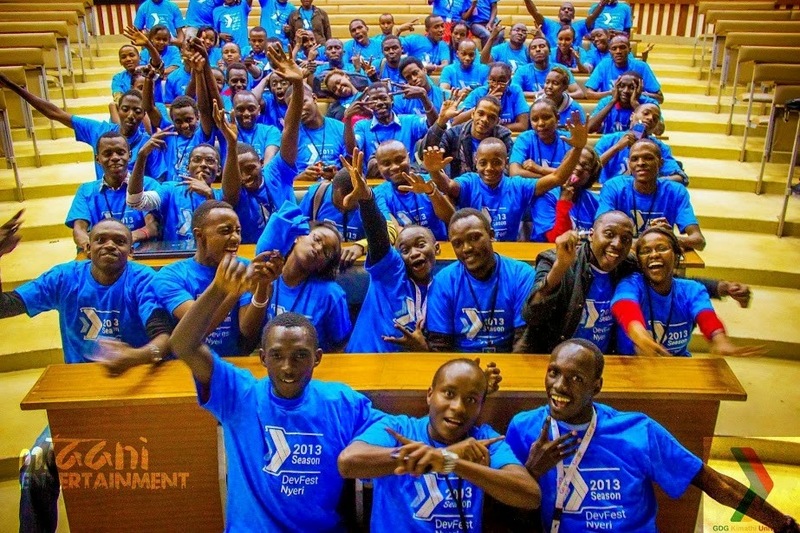 Devfest Nyeri 2013 was a great event to attend. Today I sit on my stool trying to recall. I still remember that day with Nostalgia and in fact loved all that happened that day, the connections, the talks, the lessons, the lunch, the joy we shared, the knowledge… just but a few.It was more than a just a Devfest event, It was 8 hours of pure Google content. A few days before the exciting day, that’s on Wednesday, I walk past the bus park heading to the school Mess feeling tired, then something tells me to get to the noticeboard. 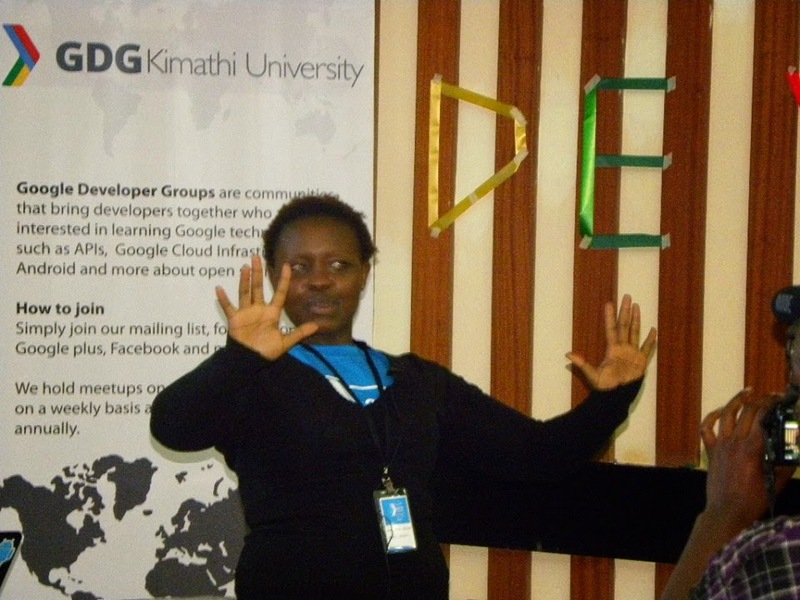 I peruse across many notices then suddenly get one that attracts my attention, GDG Devfest Nyeri 2013. I am only a freshman with no laptop, no coding skills, and definitely no idea of what GDG Devfest is about, but I deeply love tech and gadgets, and just like the great Albert Einstein once quoted ‘The human spirit yearns to prevail technology’ I too has my share of technological willingness. So I head over to my friend +Billy Rotich , and tell him the good news. There and then, we get on line and after reading more about it we load the Eventbrite page, on realizing the tickets are free, we book event tickets for ourselves and three for our friends. It seems a long wait, Thursday and Friday pass and finally its Saturday, I wake up at six in the morning, do the necessary and can’t forget to carry my notebook and pen.Having no laptop won’t deter me from attending.I take tea at the mess and cut across the university to the venue, Auditorium. It’s only then that I reside to the fact that I am the first to arrive. I have no problem with that, sometimes I am more than just passionate. The Devfest receptionists here are by all standard professional, they confirm the validity of my ticket, gives me a tag and I’m in. The Event starts by our own GDG lead, +Kenneth Kinyanjui . He talks about emerging Google technologies, specifically Google cloud platform and the chromium project. After him +Joseph Ndungu take us through Chrome Dev Tools. And immediately, +arlus ishmael , another GDG lead adds more on Google Cloud Platform.Then Mr. +Femi TAIWO a web developer and Nigeria's GDG champion takes center stage. He introduces us to the world of cross platform development with html5. He gives an invigorating lecture mainly focusing on android app development and Intel app framework. had ensured the tastiest savory foods had been prepared for the event attendees, and oh my, did people feast. This may come as a motivation to others, but be sure where there is Google, there is untamed satisfaction, even in the catering section. After finishing the meal, that’s when I realize that we should not be this less. How could so many miss this so important Devfest? Did they attend another GDG Devfest somewhere? Or they just never got keen on the noticeboard? My hunch tells me the latter is not far from the truth. Back in the venue, we divide ourselves in groups and I choose code lab 1, the android class, together with my closest of friends, other attendees head over to code lab 2: Google App Engine. We are taught by, +James Odede , GSA Maseno University about android apps, we get installed Android Eclipse and Android studio. All I have is my notebook, and it is almost enough. A projection was made on the projector board, so even if one doesn’t have his/her own laptop, one could still follow the steps effectively. My friend Billy has a laptop so I move closer to him and we get down to business.We try to code, to some of us it’s the first time coding, we err, but won’t give up easily. When the error gets too complex, we call one of the leaders who readily assists us. And after seeing I note down the error because next time with or without a laptop I will be here and it will be me helping others. In between, we are served with refreshments. We Code three more hours and its dark. We rejoin again in the Auditorium. Talk about beauty and brains, women and tech and the name +Njeri Chelimo crosses your mind.She is Nairobi’s own GDGw Lead, a lady whose passion in technology raises the roof and most certainly inspires a lot of the ladies to follow suit boldly and enter the beautiful yet utterly competitive world of technology. She talks about the Diversity in Technology. By seven we are tired but still eager to learn, again we are added more refreshments, +Said Fuad (GDG Champion Kenya), then talks about UI/UX design on the Android Platform, He focused on the Action Bar and gave us reasons why we should use it. 30 more minutes and he is done. The speakers with all the wealth of knowledge, interact with everyone freely, always ready to share their knowledge with us. We make many great friends, some create strong bonds, and most importantly, connections. I mean connections with the speakers and people like +Andrew kyalo (Former Lead GDG JKUAT), +Dennis Riungu (GDG JKUAT) and many more. To conclude the event the audience are being asked random questions, after that, students from each year are asked randomly to say something about the event. My friend +Chris Barsolai is not the biggest fan of talking to crowds, He tries to evade the speaker’s attention but woe unto him, the speaker decides to choose the first year in yellow t-shirt. It’s him, so he gathers confidence, stands up and speaks out. All those who talk receive schwags (T-Shirts). We also receive the remaining-Shirts. 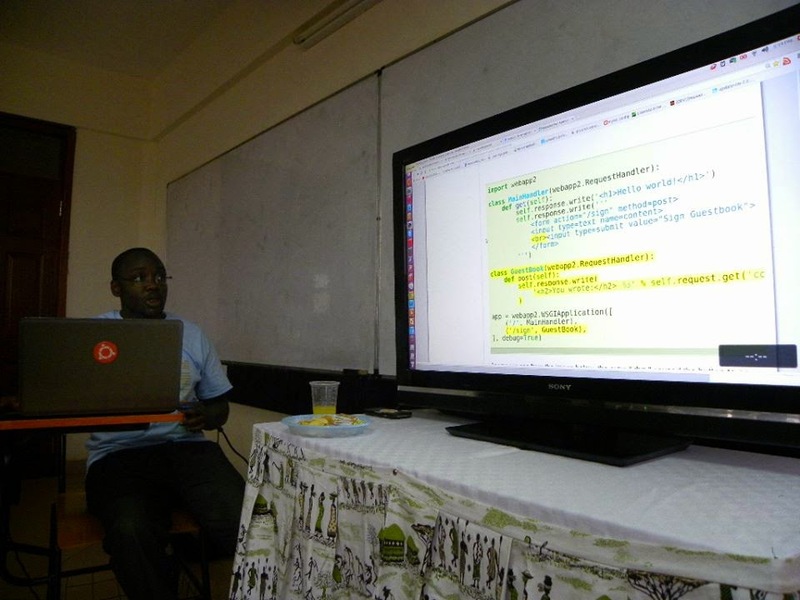 Its 8.00 p.m. GDG Lead and mentor, +Kenneth Kinyanjui brings the event to an end by issuing his closing remarks. He thanks all the attendees for making the event delightful. The event is over. We take photos to mark the day, for remembrance and for future reference. Then everyone heads his own way. I get home inspired, sit my on my bed and make a decision to tolerate no less. “I too can make their lives work my own”, I soliloquize. The events bequeath and instilled in us some principles: Hard work, Persistence, faith and many more. We learnt many ideas lies hitherto untapped, and we are at the prime age of making those ideas come true, making those ideas change the society as whole and the world at large. The fundamental cluster of the Devfest managerial portfolios are beyond reproach, yet they are just students, students like us, we can only and unanimously define the GDG Devfest committee as concise clear and colored with pride. Big up Marshalls. In all humility, we appreciate you for literally going beyond the call of duty to elevate DeKUT to a higher standards .And while I will always fall short of their examples, they make me want to be a better man. 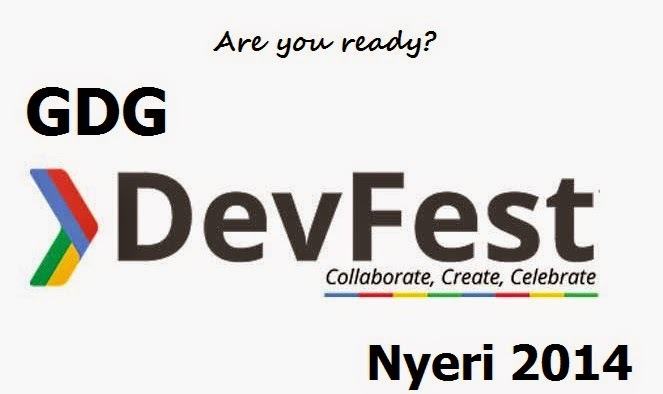 And now, Devfest Nyeri 2014 is here. I am excited and one can only hope, no I don’t hope, I most certainly sure that the event is going to be bigger, better and more interesting this time round, and so if you are out there and feel technology is in you, this is the right event, this is your time comrade, welcome all, and let’s do the cool stuff that matters.